“Do not go where the path may lead, go instead where there is no path and leave a trail.” Attributed to Ralph Waldo Emerson, this could be the credo of our industry. Moore’s Law has created $13 trillion of market value and we’ve been pioneering the way forward – since even before Gordon Moore made the famous “observation” that became Moore’s Law more than 50 years ago. Our industry paved the road forward with advancements in design, materials, processing, equipment, and integration, traveling at the speed of exponential growth number in transistors per chip (doubling approximately every two years). Today, globally, we’re shipping more than one trillion ICs per year! Leading-edge chips boast more than 10 billion transistors at the advanced 10nm (gate length) technology node and are made with 3D FinFET architectures formed by 193 nm wavelength immersion multi-patterning lithography. It’s become a very challenging – and very expensive – road (a single lithography tool alone costs in the tens of millions of dollars). 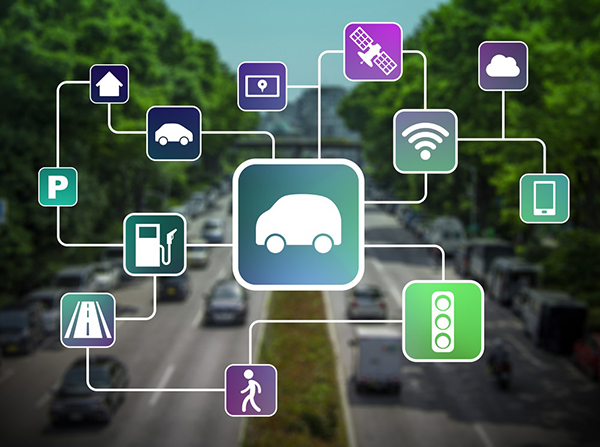 The companies building the road ahead are bigger and fewer as massive bets now need to be placed on new fabs costing more than $5 billion and even $10 billion and where a new single chip design alone costs more than $150 million to bring into production. What follows is a quick look back at the industry in 2016 and the road ahead in 2017 followed by what SEMI achieved in 2016 and where SEMI’s road will lead in 2017 to keep our industry charging forward when there is no clear path. I will also focus on SEMI 2020 initiatives. 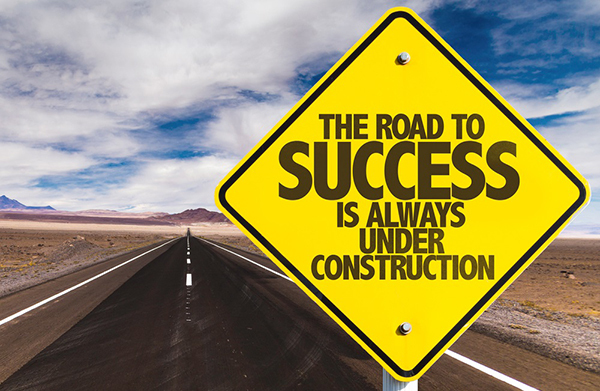 A Look Back at 2016, "Straight Roads Do Not Make Skillful Drivers"
2016 was definitely not a straight road; truly it was a wild ride – so, SEMI members have become extremely skilled drivers. The semiconductor manufacturing industry had a slow first half with pessimism building throughout the first quarter, but by April semiconductors bottomed and NAND investment and a slate of new China projects drove a strong second half. For semiconductor equipment, SEMI’s statistics indicate global sales in 2015 were $36.5 billion and 2016 came in at $39.7 billion, ultimately ending up about 9 percent. For reference semiconductor materials in 2015 was $24.0 billion and 2016 came in at $24.6 billion, up nearly 2.6 percent year-over year (YoY). But, it turns out, that’s not half the story. 2016 was full of surprises. At the geopolitical level, Brexit, an impeachment in South Korea, and a Trump win were wholly unanticipated and leave a lot of questions as to how that road ahead might look. In technology, the Galaxy Note 7 mobile phone became an airline hazard announcement and stalwarts like Yahoo! faded into the background (now part of Verizon). In part due to challenges of the road ahead (and because the cost of capital remained low) M&A fever continued in semiconductors with more than $100B in deals announced in 2016. It was an astonishing year for combinations with huge deal announcements such as Qualcomm buying NXP for $47 billion and SoftBank buying ARM for $32 billion. Meanwhile, mergers in the equipment and materials space continued, to name a few notables ASML’s acquisition of Hermes Microvision, DuPont and Dow announcing the intent to merge (announced December 2015, but still in the works), and Lam Research and KLA-Tencor ultimately calling off their deal due to complications of regulatory pushback. The extended supply chain was mixing things up, too, with acquisitions like the announcement by Siemens to acquire Mentor Graphics. It has been very active, overall. This was the second year of semiconductor M&A deals valued at more than $100 billion, a signal that size and scale is critical to build the road ahead. 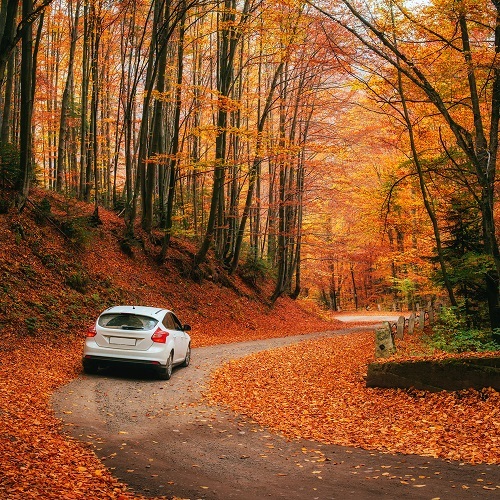 A Look Ahead, "Difficult Roads Often Lead to Beautiful Destinations"
With all the talk about roads, it’s no surprise that the automotive segment is gathering momentum as a strong growth driver for the electronics supply chain. 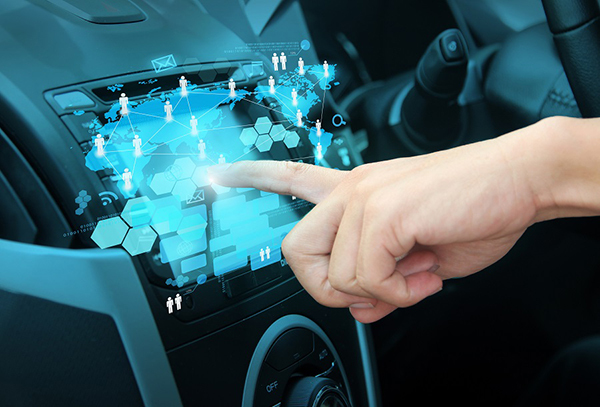 Not only is there increasing electronics content in cars for comfort and infotainment, but also for assisted and autonomous driving and electric vehicles which are ushering in a new era of electronics consumption. 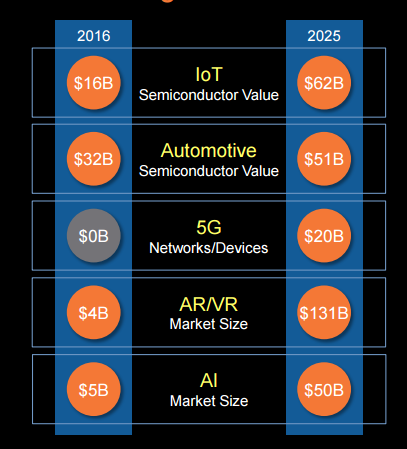 Along with automotive, IoT (Internet of Things), 5G, AR/VR (Augmented Reality and Virtual Reality), and AI (Artificial Intelligence) round out a set of powerful IC and electronics applications drivers (see figure). Per an IHS Study, 5G alone may enable as much as $12.3 trillion in goods and services in 2035. Gartner’s most recent forecast is cause for optimism further down the electronics manufacturing supply chain. Gartner see IC revenue growing from 2016’s $339.7 billion to 2017’s $364.1 billion up 7.2 percent and growing further in 2018 at $377.9 billion up 3.8 percent. For semiconductor equipment, SEMI’s forecast indicates 2015 was $36.5 billion, 2016 will come in at $39.7 billion, and 2017 is projected to be $43.4 billion, pointing to both 2016 and 2017 experiencing approximately 9 percent YoY growth. In 2017, China investment is projected to continue as a major driver, likely consuming over 16 percent of the total global equipment investment (second only to South Korea). SEMI is currently tracking 20 new fab projects. Investments come from both multinationals and local Chinese ventures. A sign of the rise of China is China’s upward production share trend of its own IC consumption market (IC Insights): 8 percent in 2009, 13 percent in 2015, and 21 percent in 2020. Further down in the electronics supply chain, fab equipment related spending in China will rise to more than $10 billion per year by 2018 and remain at that level or above for subsequent years. 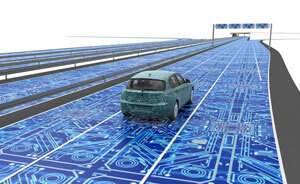 NAND will continue to be a major driver with 3D NAND investment leading the way. Silicon in Package (SiP) and heterogeneous integration will increasingly be solutions to augment traditional feature scaling to fit more transistors into less space at lower costs. Materials innovations will be relied upon to solve front-end and packaging challenges while standard materials will be the focus of increased efficiencies and cost reduction. 200mm fab capacity will grow and stimulate new 200mm investment with upside driven by power devices and MEMS segments. Investment in foundry MEMS will grow by an estimated 285 percent (2015 to 2017). "There are Far Better Things Ahead than Any We Leave Behind"
SEMI, the global non-profit association connecting and representing the worldwide electronics manufacturing supply chain, has been growing with the industry for 47 years. SEMI has evolved over the years, but it has remained as the central point to connect. Whether connecting for business, connecting for collective action, or connecting to synchronize technology, SEMI connects for member growth and prosperity. As a reminder, here are SEMI’s mission, vision, and 2020 strategic focus areas. SEMI provides industry stewardship and engages our members to advance the interests of the global electronics manufacturing supply chain. SEMI promotes the development of the global electronics manufacturing supply chain and positively influences the growth and prosperity of its members. SEMI advances the mutual business interests of its membership and promotes a free and open global marketplace. 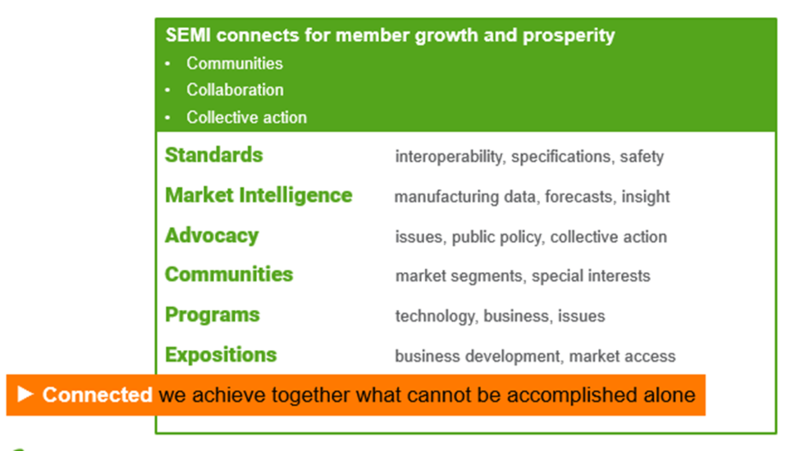 SEMI enables member growth opportunities by evolving SEMI communities and building new communities across the global electronics manufacturing supply chain via cooperation, partnerships, and integration. SEMI enables members to prosper by building extended supply chain collaboration forums providing opportunities to increase value while optimizing the supply chain for SEMI members. Our industry is in the midst of a vast change. To deal with the escalating complexity (making a semiconductor chip now uses the great majority of the periodic table of the elements) and capital cost, many companies have had to combine, consolidate, and increasingly collaborate along the length of the electronics manufacturing supply chain. 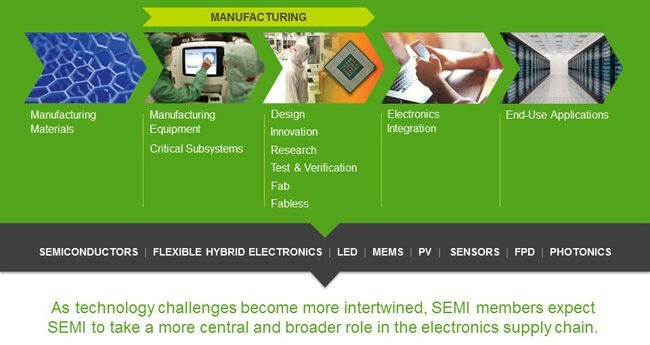 Some companies have broadened their businesses by investing in adjacent segments such as Flexible Hybrid Electronics (FHE), MEMS, Sensors, LEDs, PV, and Display. Lines are blurring between segments – PCBs have morphed into flexible substrates, SiP is both a device and a system. Electronics integrators are rapidly innovating and driving new form factors, new requirements, and new technologies which require wide cooperation across the length of the electronics manufacturing supply chain and across a breadth of segments. The business is changing and SEMI’s members are changing. When SEMI’s members change, SEMI must change, too – and SEMI has, and is. SEMI developed a transformation plan, SEMI 2020, which I wrote about at the beginning of 2016. We’re well on our way on this path and in next week’s e-newsletter Global Update, I’d like to update you on what we’ve accomplished and what’s to come. I would also like to talk about where the industry is going and how SEMI is changing to keep up with it. As not everyone is aware of all SEMI does, the following is a quick reminder on how SEMI works to represent the industry before looking ahead to 2017, specifically, and beyond. SEMI has been growing with the industry for 47 years. While SEMI has evolved over the years, it has remained as the central point to connect. 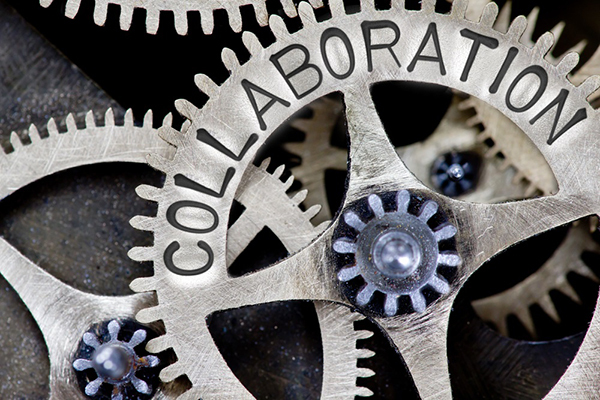 Whether connecting for business, connecting for collective action, or connecting to synchronize technology, SEMI connects for member growth and prosperity. The business is changing and SEMI’s members are changing. When SEMI’s members change, SEMI must change, too – and SEMI has, and is. SEMI developed a transformation plan, SEMI 2020, which I wrote about at the beginning of 2016. We’re well on our way on this path and I’d like to update you on what we’ve accomplished and what’s to come. SEMI organized its SEMI 2020 transformation into three basic pillars of the SEMI 2020 strategy. First, “reenergizing the base,” where SEMI focuses on enriching delivered value for the present day needs of its traditionally engaged membership base. Second, “building communities and collaboration,” where SEMI works to develop specific forums and groups to meet specific needs and focus on specific technologies and products. Third, "evolving SEMI value propositions for 2020,” which is the work of changing and innovating SEMI products and services for the needs of the industry in the future. Development of SEMI Collaborative Technology Platforms with initial activities in Interconnect, Heterogeneous Integration Roadmap (partnered with IEEE CPMT, EDS, & Photonics Societies), etc. Advocacy activities leveraging collective action on trade, industry funding, export control, taxation, and sustainable manufacturing (including regulation of safety, materials, and environmental impact). SEMI continues to conduct surveys, uses multiple means of gathering the voice of the customer, and constantly aligns with guidance from its various committees, regional advisory boards, and International Board of Directors. Despite its name, SEMI 2020 is a journey and not a destination. SEMI will continue to evolve, develop, and add critical communities, services, products, and industry advocacy as SEMI’s members evolve. While many of the SEMI activities captured above will continue, the following provides a sampling of activities more specific to SEMI’s work in 2017. This quotation, generally attributed to Confucius, ties the themes of the road of this year’s annual update to my personal journey. As you may know, at the end of 2016, I announced my intention to retire and while I’ll remain until a successor is identified, this will be my last SEMI update. My personal journey has definitely not been a straight line and that’s made it all the more interesting – and, I hope, made me a “more skillful driver.” Instead of the road, the sky used to be my home (although, with trips to Asia and Europe, sometimes it still feels like I’m still there! ), with many years flying with the United States Air Force. After that, my path led to the world of non-profit leadership and eventually, prior to SEMI, leading IPC, the interconnect trade association. As the industry has blurred the borders of PC boards and substrates and semiconductor packages, maybe it was natural that I would also shift from IPC to SEMI. I’ve been at SEMI for over five years and have constantly been amazed by the speed of the industry, the exceptional professionals and their astounding innovations, and the tight global cooperation and support. When I started, there was a flashpoint in the potential jump to pursue the 450mm wafer size. I got to know our industry and our members very quickly! But, I almost immediately learned, this is a unique industry where collaboration across the electronics manufacturing supply chain is critical, where global stakeholders are well connected, and where – with Moore’s Law as precedent – industry leaders are used to working together, no matter if collaborators or competitors, for the good of the industry. I am grateful to call many in our industry friends. It is with regret that I won’t be seeing these friends as frequently as before, certainly. However, I am pleased to be leaving behind a sound a valued SEMI organization with the professionals and plans in place to carry SEMI 2020 forward and deliver more valued services, products, and above all connections for its members. I am happy for my time at SEMI and am grateful to the SEMI staff, SEMI International Board of Directors, and SEMI Members for the opportunity to serve the amazing association. Learn more about SEMI membership, upcoming events, standards, and market research. Also visit www.semi.org and follow SEMI on LinkedIn and Twitter.